Eight Western countries stayed away from a meeting with Sri Lanka’s government on Monday to register their protest against President Maithripala Sirisena’s decision to dissolve parliament, diplomatic and government sources said. Sri Lanka has been in political turmoil since Sirisena fired Prime Minister Ranil Wickremesinghe last month and appointed a pro-China former president, Mahinda Rajapaksa, in his place. Western countries led by the United States and the European Union had been urging Sirisena to convene parliament and let the legislature determine who should be prime minister. Sirisena reconvened parliament on Nov. 14, but on Friday, he dissolved it and ordered a general election for Jan. 5. Foreign Minister Sarath Amunugama called the heads of 43 foreign missions for a meeting on the political situation on Monday but only a handful turned up, the sources said. The ambassadors of Britain, Netherlands, Norway, France, Australia, South Africa, Italy, and Canada did not attend the meeting while European Union, the United States, and Germany sent representatives, the sources said. India, Sir Lanka’s nearest neighbour, sent a junior representative. Western governments are especially concerned that the return to power of wartime nationalist strongman Rajapaksa could endanger halting steps toward national reconciliation. The government defeated separatist guerrillas from the ethnic Tamil minority in 2009, after more than 25 years of conflict. Rajapaksa has said he wants to end religious and ethnic divisions. The EU has warned it could withdraw trade concessions if Sri Lanka backs off commitments on rights. Diplomatic and government sources said at least 20 heads of missions turned up for the meeting including those of China, Cuba, Afghanistan, Turkey, and Pakistan. China, which has invested billions of dollars in infrastructure projects in Sri Lanka, has called for non-interference in its affairs. At the meeting Foreign Minister Amunugama said all of the decisions that have been taken over recent weeks were in line with the constitution. “Most countries have stated that they are watching the situation … Of course there are uncertainties. But there has been no violence,” he later told reporters. Japanese officials have said they will halt a $1.4 billion soft loan for a light rail project while the United States is holding off on a $480 million infrastructure grant until the political crisis is resolved and democratic rights are restored. Amunugama, however, said no country has said anything about grants, concessions or loans. 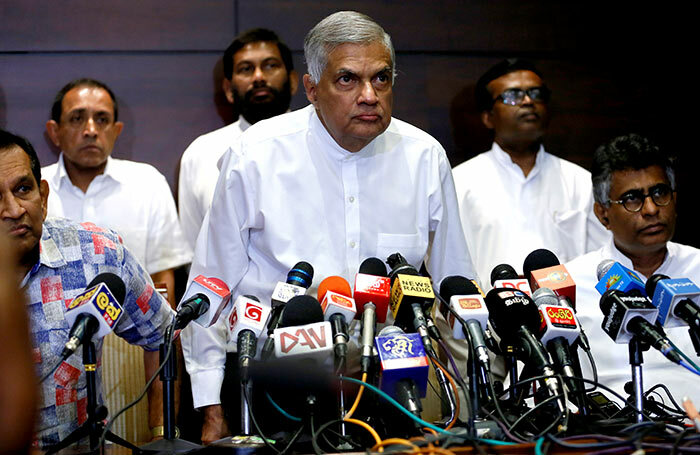 Piling on the pressure, Wickremesinghe and his allies petitioned the Supreme Court to cancel the presidential order dissolving parliament without allowing a vote to test his support in the assembly. “We are at the Supreme Court awaiting consideration of our fundamental rights petition against the unconstitutional action by President Sirisena,” Harsha de Silva, a Wickremesinghe loyalist said on twitter. The court later adjourned the hearing until Tuesday. Sirisena has faced international criticism for plunging the country into crisis at a time when the economy is growing at its weakest pace in 16 years. On Monday, the rupee hit a record low of 179.90 to the dollar and its dollar-denominated bonds tumbled. Confirmed, SL is now a real time PARIAH STATE. If constitutionally valid, go ahead with the election , and if people give power, do the same way we did before the previous election. Prepared for the resurrected war crimes allegations coming from Geneva et al. Well, I read yesterday in a Sri Lankan DailyNews that Sajith Premadasa conformed Sirisena offered the PM post to him. 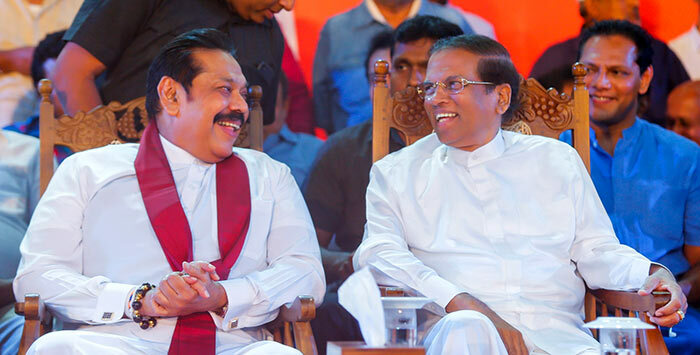 So, like those diplomats and some trying to brainwash us that there was a big coup between Sirisena and Rajapaksha has happened to give power to Rajapaksha clan has not happened at all. Sirisena has first given it to a UNPer who thinks capable of running the country , thus respecting the result of the previous general election. If he can constitutionally hire or fire the PM, so be it. The matter is before the SC now. Hopefully we don’t have to wait for long.